MIO patented self-trailing Rope Grabs (Models: RG) are designed to provide fall protection for workers ascending or descending a vertical lifeline and are intended to be used as part of a complete fall arrest system. Our grabs can be easily attached, detached and repositioned at any point on the vertical lifeline and automatically lock in place in case of a fall. Applications for rope grabs include: window washing operations, protection of a worker on scaffolding, powered platforms, rope descend system, ladder climbing, construction, general industry and etc. RG-716 Rope Grab for 7/16" rope. RG-716-3LS Rope Grab for 7/16" rope w/ 3ft. lanyard, shock absorber and a hook. RG-1200 Rope Grab for 1/2" rope. RG-1200-3LS Rope Grab for 1/2" rope w/ 3ft. lanyard, shock absorber and a hook. RG-5800 Rope Grab for 5/8" rope. 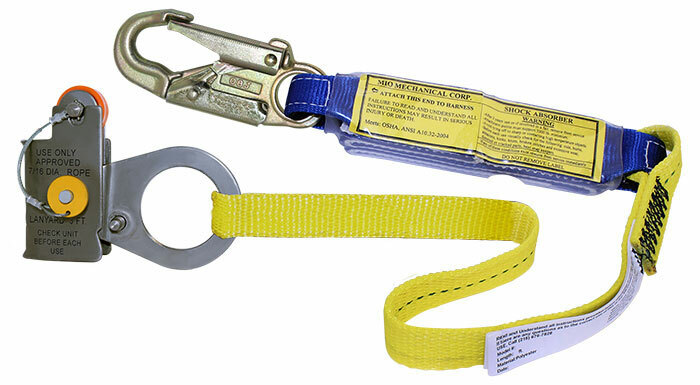 RG-5800-3LS Rope Grab for 5/8" rope w/ 3ft. lanyard, shock absorber and a hook. RG-5834 Universal Rope Grab for 5/8" & 3/4" ropes. RG-5834-3LS Universal Rope Grab for 5/8" & 3/4" ropes w/ 3ft. lanyard, shock absorber and a hook.